Over the past few months, I have tried to make my blogging an easier and more streamlined process. If you blog you know that there are a million little tasks that need to get done. Writing posts, taking photos, social media, SEO, Guest posting, etc. The list goes on and on.So I have been trying to find ways to stay more organized and get my tasks done quickly and easier. That way I can get through my to-do lists. One of the ways that have really been working for me is having a calendar. So I wanted to share with you how to use an editorial calendar. Using one has made my blogging life easier and more effective. I have tried to make an editorial calendar a few different ways and some things work better on one than another. 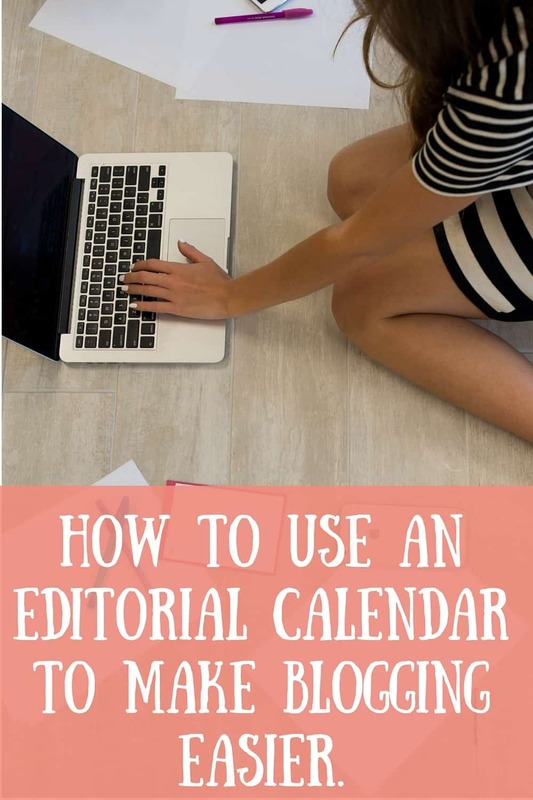 So here is what I’ve learned along the way and how you can start using an editorial calendar with your blog. Hopefully, you will find a way that works for you. I used coschedule for a long time and it’s a really great system. I wrote a post on it awhile ago and used it for over a year You can read my coschedule post here. If you haven’t used coschedule it is a plugin on WordPress that allows you to schedule your posts and social media shares. Although it was a good tool and I don’t really have anything negative to say about using it. I decided awhile ago that I needed to try to find something that worked better. I think the thing I disliked most was having my posts and social media blog postings all on one calendar. Also, it is a paid for plugin to use coschedule. I think it was only $5 a month for me when I was using it and I don’t know what the price is now. I just want to share that so you are aware that there is a cost. It was worth the price because as I said I don’t have any negative reviews it just stopped being the right fit for me and my blog. I use Google Calendar to schedule my work hours and to keep track of my appointments. I like using Google calendar because I have access to it from my computer, my iPad and from my phone. I really like having access to my calendar wherever I am. I realized though that while I like the calendar for scheduling my days and keeping track of things. It wasn’t the best fit for me when it came to an editorial calendar. I think that it made things too overwhelming for me. Having blogging, personal and family stuff all in the same calendar was too much. I still use the Calendar on Google for everything else except for an editorial calendar. I’m sure there are ways to make it easier and use the Google calendar for everything. I’m not an expert on that calendar but I felt that there was probably a better and easier way for me to make a calendar for my blog. Then I started using my calendar that is in my WordPress Dashboard. I’ve been using this calendar platform for a few months now and am really liking it and it feels like a good fit. I really like that it is right on my dashboard on WordPress since I’m already there all the time anyways. I thought since I’ve now gotten a better handle on using this for my editorial calendar that I would share how I plan out my posts for the weeks ahead. Hopefully, that will give you a better idea on how to use an editorial calendar and why you should try using them. It took me awhile to really start using them myself. I used nothing for over a year. Then I used co schedule for a year. Then I tried google for a few months and now I’m using this. There was a lot of time over my blogging career I used nothing or when I was using something but not really well. Here is a screenshot of what my calendar looks like right now. I thought I would share what it looks like so you could better picture it while I explain how I set it up and what my process is. All bloggers are different, though. We have different types of blogs and different ways of being organized. So if you want to try using an editorial calendar, which I think all bloggers can benefit from. If I have any sponsored posts or guest posts or anything I need to post on a specific date I go in and add those posts. That way I know they are on there and can fit everything else around them. I don’t have anything set in for November. I had a few in September and October so I didn’t want much for November plus we are busy a lot of the month. My next step is I go through the upcoming month and schedule in all my weekly posts that I do each week. Like my Roundup post on Thursday and my Motivational Mondays post on Sundays. That way I get them on the calendar first. Also doing them on the WordPress calendar when I add them in that is the title so I can just copy and paste and change the number each week. Then I go through and add in what types of posts I want to do each week. Right now I’m aiming for one blogging related post and one marriage or parenting related post a month. That way I have a mix of blogging and also helpful life posts. I noticed that my readers like tips and advice posts and since I know a good amount about parenting and marriage I want to have some of those topics as well. When I add in these posts I don’t have a title for them yet because I usually plan a month ahead. So I just put a description of what my post will be on. Like for today’s post I just put blogging schedule or I could have put editorial calendars. It’s just to give me a reminder of the post topic I want to write about and post that day. When I have just written the title or topic the status of the post is listed as pitch, then once I’ve published the post it changes to published. That way I can see which of my posts I had planned to do didn’t end up getting done and try to move those topics to the next month. One other helpful feature of this calendar is that you can pick things up and move them. Say I’d have rather posted this post on this Friday instead of today on Wednesday. I can just click and drag it to Friday. I don’t have to delete it on Wednesday and put it back in on Friday. Once I have the month set I can go through and see which weeks look too empty of full and adjust things. I can also see if I’m blogging too much or not enough about a certain topic. Doing this editorial calendar has made such a great impact on my blogging and what I’ve been able to accomplish. I hope you will give using a calendar a try if you aren’t already. What areas of your blog life do you need tips on and help to get more efficient in? Leave me a comment and let me know what areas you need help in and what you need to learn. If you found this post helpful or useful I’d appreciate if you’d share or pin it to Pinterest please. I should try out WordPress Calendar! I definitely need to make a schedule. I would love to give this calendar a try, but I don’t see it in my WP Dashboard. I’ve used Co-schdule and I’ve quit using it and need something new. Is this a plugin? I hate google calendar. I just have a routine down, so I know when and where I’m supposed to do stuff. But, maybe if I become busier it’ll come in handy. I would have loved to try out the WordPress calendar but sadly I am on Wix. This would have been perfect for me. I actually use an Erin Condren Life Planner as my editorial calendar. I am a paper and pencil kind of gal. I love that there is a lot of space for me to outline posts and other items that I need to check off every day. I try to spend an afternoon brainstorming a couple months out, and then right before the new month starts I try to plug it all into the dates that the posts should go live. It is a great tool! Heather recently posted…League of Little Laughers Play Date with Bright Starts! Because I’m part of a blogging duo, we’ve found Trello to be fabulous for managing our editorial calendar! I normally only plan about 2 weeks ahead because doing it a month ahead seems daunting o me. I really would like to give it a try. Maybe after the holidays when things calm down, I can get into a better routine and make a good schedule to get ahead. Thank you for your tips! I need to be so much better at this! I struggle to calendar everything and tend to fly by the seat of my pants! I really need to make a schedule for all the posts in my drafts. Thanks for your suggestions. I use the Word Press editorial calendar also. But I can’t schedule too far out or I get lost – I seem to flip ideas around a lot. I do find it to be a perfect placeholder for ideas that are timely. I’m new to the blogging scene, and I just love this idea of using an editorial calendar to help keep everything organized. Thanks for giving us a little insight on what goes on behind the scenes. I HAVE to write things down in my planner. Nothing else really works for me. Thanks for sharing though. I’ve been using Coschedule for close to a year and I feel the same way. It does some things well, but I wish it did more. I’m going to look into the WP version. I assume it’s a plugin? I’ve been using the WordPress calendar for a couple of years and it’s a wonderful visual tool to make sure I have content going up. It’s also helpful that I can quickly move topics around if I have to many of the same type of content going up together. I love using an editorial calendar! I used to make mine in MS Word but I’m slowly moving over to CoSchedule. I love that it allows me to schedule out my social media too! This is something on my 2016 goals list! I need to get better about this type of stuff! Thanks for the tip on the calendar through wordpress. I need to get organized again with my posts this year – I did good with it and following a calendar a couple of years ago but not so good last year. I’m a big Google calendar lover. I’ve got a system down now where I have an Idea notation, a Draft notation and a posted or scheduled notation so just by looking I see what days I need to work on. I’m hoping to switch over to the WP plug in, but I’m still loving the Google Calendar for now. Thanks for the information though! .